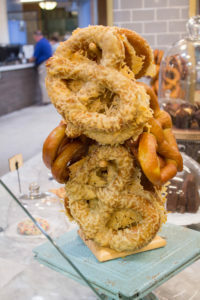 Headed by Executive Pastry Chef Lori Sauer, Crafted Baked Goods is an open-air showcase and exhibition kitchen that allows customers to watch our pastry artisans in action. Cookies and brownies and everything inbetween (brookies! ), as well as seasonal tarts, pies, and cakes, are among the sweet offerings showcased at Crafted!